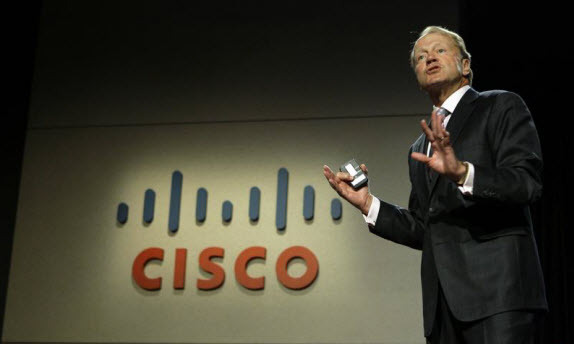 Cisco CEO, John Chambers, spent Good Friday reflecting on Cisco Systems’s resurrection as a more formidable competitor, after his team took the company through a major reorganization. “The market changed on us. We had to change as fast,” Chambers told investors and journalists at the Wall Street Journal Viewpoints breakfast forum in Menlo Park, Calif.
Over the past year, Cisco has cut costs, overhauled business units and sharpened its focus on top-priority areas. Chambers reaffirmed the new focus on getting profits to rise more rapidly than revenue, stressing the need to “catch market transitions.” A prime opportunity: “I think video will be the primary way IT [information technology] delivered,” Chambers said. Cisco also faces critical challenges. One is from a company that Chambers sees emerging as Cisco’s toughest competitor: Huawei Technology Co. Ltd., the Chinese networking behemoth. Although safeguarding intellectual property remains a high-level concern in taking on Chinese rivals, Chambers offered an upbeat view of China and its relationship with U.S. corporations. Intellectual property, he said, is becoming increasingly important for China as its own tech industry grows. “I think our countries will move closer together,” he said. Huawei, Will Exceed Cisco, Google in the Future? Why Cisco is the Best…? Why Router-switch.com…?